A method using more sensitive closely coupled probes for d-c potential drop technique is applied to distinction of alloy steels. The probes are synthesized to build a small sensor. Some alloy steels, which are different from each other in chemical composition, are tested in experiment. A simple equation of the potential drop for an uncracked plate is obtained. Using the equation, the electrical resistivity of the materials is calculated. It is found through multivariate analysis that the resistivity of the alloy steels correlates well with their chemical composition. As a result, it is verified that the closely coupled probes potential drop technique is useful for the evaluation of resistivity in a moment and the distinction of alloy steels. At present, an electromagnetic testing or the methods of using the magnetization characteristic are used for distinction of metallic materials. When dealing with the alloy steels, the electromagnetic testing is unsuitable because the method is strongly affected by magnetic permeability. In the method of using a magnetization characteristic, the effect of a residual stress or a residual magnetization on the magnetic permeability must be considered. Recently, the portable equipment for distinction of alloy steels by means of ultimate analysis using X-ray fluorescence techniques has been developed . However, the equipment is not cheap and also the strict management is inevitable to treat its X-ray sources. By the way, d-c potential drop technique is powerful tool for quantitative NDE of cracks. The technique using four probes, which are in close proximity to each other, has recently been proposed ; that is the closely coupled probes potential drop (CCPPD) technique. It has been shown that the sensitivity of the CCPPD technique is enhanced significantly in comparison with the usual method using a uniform current flow in the region far from the crack. In addition, the sensor of the CCPPD technique is easily positioned with smaller system. 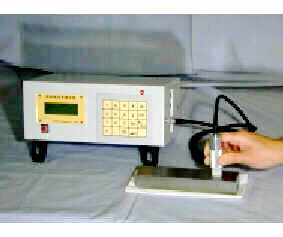 By applying the CCPPD technique at the uncracked part of the material, the electrical resistivity of the material can easily be measured. Because the resistivity depends on the composition of alloy steels, by measuring resistivity using the CCPPD technique, the distinction of alloy steels is possible. In the present paper, the way of distinction of alloy steels by means of the CCPPD technique is proposed. Let us consider a 3-D problem of measuring potential drop on the surface of a semi-infinite material as shown in Fig. 1. The constant d-c current, I, is input at x=s1 and is output at x=-s1. The potential drop V is measured between two points at x=±s1, where four points of current supply and measurement are all on x-axis. Specimens were made of 12 kinds of alloy steels that are different from each other in chemical composition as shown in Table 1. The specimens have cylindrical shape and the size of 34mm in diameter and 16mm in thickness as shown in Fig. 2. The distance of two probes for current input and output was 2s1=6mm, and that of two probes for measuring potential drop was 2s2=3mm as shown in Fig. 2. All four probes were synthesized to build a pen-like sensor. The sensor is small and easy to deal with as shown in Fig. 3. The contact of every probe to the specimen surface was made constant by using springs. Figure 4 shows the measuring system. The equipment for the CCPPD technique contains constant d-c current source, microvoltmeter, microcomputer and display. Setting the sensor at the center of specimen surface, constant d-c current in the amount of 1A, was applied to the specimen through the current input and output probes. The potential drop V was measured by the measuring probes. The resistivity r was calculated by microcomputer from Eq. (3), and was displayed in a moment. The measurement was made 10 times with rotating the sensor in circular direction. By using the CCPPD technique, the electrical resistivity of the alloy steels in the range of 18 to 29 ´ 10-8W×m was obtained as shown in Table 2. Dispersion of resistivity in 10 times measurement was less than 4 percent. Make the list of the value of y using Eq. (4) based on the chemical composition for all materials being candidate. Measure the electrical resistivity of the specimen by means of the CCPPD technique. Read the value of y from Fig. 5 corresponding to the resistivity of the specimen. Identify the material of the specimen from other by comparing y of the specimen with that in the list made in step1. The closely coupled probes potential drop technique that has been proposed for sensitive evaluation of crack was applied to distinction of alloy steels. The electrical resistivity of alloy steels was measured by the CCPPD technique. It was found that the resistivity of the alloy steels correlates well with their chemical composition. The procedure for distinction of alloy steels was proposed. This technique is not affected by magnetic permeability of the materials. The sensor is small and easy to deal with in the field. It was verified that the CCPPD technique is useful for the evaluation of resistivity in a moment and the distinction of alloy steels. The authors wish to acknowledge Mr. M. Mikami of Tohoku University for his help during the experiment. Catalogue of Metallurgist Pro, TN Technologies. Saka M., Oouchi A. and Abé H., NDE of a Crack by Using Closely Coupled Probes for DCPD Technique, Trans. ASME, J. Pressure Vessel Technology, Vol. 118, 1996, pp. 198-202. Saka M., Hirota D., Abé H. and Komura I., NDE of a 3-D Surface Crack Using Closely Coupled Probes for DCPD Technique, Trans. ASME, J. Pressure Vessel Technology, Vol. 120, 1998, pp. 374-378.